Doctor's Best Pure Wild Alaskan Fish Oil at Bodybuilding.com - Best Prices on Pure Wild Alaskan Fish Oil! 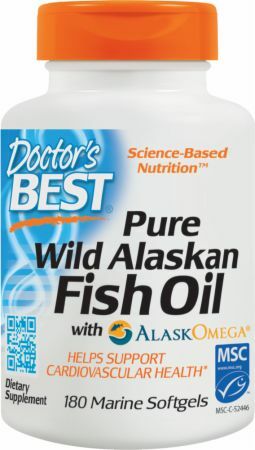 Doctor’s Best Pure Wild Alaskan Fish Oil is sustainably caught, eco-friendly fish oil, that is certified by the Marine Stewardship Council (MSC). It is processed in the U.S., immediately after being caught on board the fishing vessel, resulting in a very low TOTOX (marker of freshness) value and thereby minimizing fish burps. No Pure Wild Alaskan Fish Oil Reviews Found. Gelatin Capsule (Fish Gelatin, Glycerin, Purified Water), Mixed Tocopherols. Directions For Pure Wild Alaskan Fish Oil: Take 2 softgels daily with food and other fats to improve absorption, or as recommended by a nutritionally-informed physician. Warnings: Consult your physician if you are using blood thinning medications. Store in a cool, dry place. Learn more about Fish Oil.